Join Lea Schizas as she brings together William Koonce, Eric Keith, Marcia Berneger and Charles Mossop for a romp through the Carpathian Mountains of Romania. What exactly haunts Lord John Erdely’s castle and who will make it out alive? Each author tells their own tale of unsuspecting travellers who stumble into the dangers and mysteries of the castle. Who is Arminius? What haunts Charlie Alexander? Is there anything stronger than a mother’s love? What is the curse that stalks the castle’s walls? With short stories it is too easy to give away their secrets, so allow me to give my quick impressions of the author’s tales and the overall feel Ms. Schizas has accomplished. 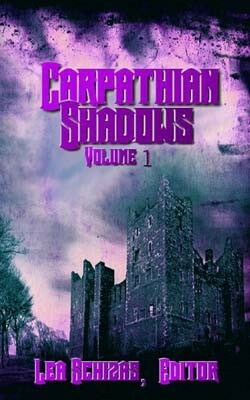 In this first volume of “The Carpathian Shadows” I have found four entertaining stories, but two are haunting emotional gems. One is from new author Eric Keith; this story is his first published piece. These four stories will fit whatever reading times you have…quick horror fix or snuggle under the covers and slowly meet the horror. Ms. Schizas has brought together and given four authors the same underlying theme and each have woven unique tales. She has offered up a haunting castle, which once belonged to a mysteries black arts practicing Lord. She entices our travellers to visit the castle with free invites. Then she throws in the malevolent storm that forces our travellers to spend the night (or two) within the ghostly walls. From there her writers’ imaginations take over. Thank you Ms Schizas, when is the next offering…oops, I mean Volume Two.